*5. 22,497　*,*22,497　Kana Nishino "Anata no Suki na Tokoro"
*6. 18,115　*,*18,115　Spitz "Minato"
10. 11,008　*,*11,008　the GazettE "UNDYING"
12. *8,306　*,814,567　Nogizaka46 "Harujion ga Saku koro"
22. *3,165　*,**3,165　Passepied "Yoake Mae"
29. *2,346　*,*61,868　°C-ute "Naze Hito wa Arasoundarou? / Summer Wind / Jinsei wa STEP!" 30. *2,275　*,**2,275　Onegai Venus by Remi from STAR☆ANIS, Mona from AIKATSU☆STARS! 44. *1,520　1,285,109　AKB48 "Kimi wa Melody"
49. *1,295　1,072,923　AKB48 "Kuchibiru ni Be My Baby"
58. *1,094　*,**6,103　Kyary Pamyu Pamyu "Sai & Kou"
92. **,601　*,538,108　Arashi "Fukkatsu♡LOVE"
98. **,562　*,**8,983　KEYTALK "HELLO WONDERLAND"
99. **,555　*,*24,649　Aoi Teshima "Asu e no Tegami"
*3. 37,621　*,*37,621　Dempagumi.inc "GOGO DEMPA"
*5. 19,025　*,*19,025　EXILE SHOKICHI "THE FUTURE"
*6. 16,447　*,*16,447　GACKT " LAST MOON"
15. *8,263　*,249,249　Ikimono-gakari "Chou Ikimono-gakari~Tennen Kinen Members BEST Selection~"
22. *4,944　*,**4,944　fhána "What a Wonderful World Line"
24. *4,054　*,**4,054　CINDERELLA PARTY! DereBare ~Doga Yattekita~ Iketeru Kanojo to Tanoshii Kouroku~ by Sayuri Hara (Voicing Mio Honda), Ruriko Aoki (Voicing Riina Tada) from CHINDERELLA PARTY! 31. *3,186　*,*23,020　LiSA "LUCKY Hi FiVE!" 41. *2,334　*,**6,313　Aoi Teshima "Aoi Works ~best collection 2011－2016~"
42. *2,325　*,145,695　"ZARD Forever Best ~25th ANNIVERSARY~"
43. *2,315　*,**2,315　Customi Z "Customi-Z"
48. *2,048　*,*12,153　Nagi Yanagi "Follow My Tracks"
49. *1,899　*,*44,085　Shiritsu Ebisu Chuugaku "Anarchy"
51. *1,785　*,174,078　ONE OK ROCK "Niche Syndrome"
55. *1,614　*,**1,614　DOES "INNOCENCE"
58. *1,559　*,**1,559　Strike Witches Theme Song and Insert Song Collection by Yoshika Miyafuji (CV: Misato Fukuen), etc. 61. *1,526　*,**1,526　Strike Witches Hime Uta Complete BOX "STRIKE WITCHES" by Yoshika Miyafuji (CV: Misato Fukuen), etc. 66. *1,442　*,*24,489　SiM "THE BEAUTiFUL PEOPLE"
70. *1,382　*,259,021　Bump of Chicken "Butterflies"
82. *1,214　*,*13,331　Sukima Switch "POPMAN’S ANOTHER WORLD"
87. *1,094　*,**1,094　Kaori Oda "Make it"
90. *1,076　*,**3,759　D.A.T (Daisuke Ono, Takayuki Kondou) "D．A．T BEST ALBUM SUITE"
97. **,988　*,158,971　MAN WITH A MISSION "The World’s On Fire"
Their 1st single cd sales was boosted by the mere presence of µ's. This 2nd single is completely cause of them.. no µ's at all yet they sold almost as good as their 1st. Yeah, I agree with this. It would have been nice to equal or better the debut but holding on to 97.5% of the 1st single's sales is great. 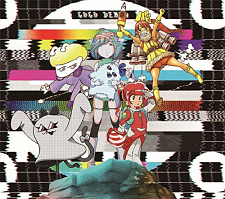 Will be interesting to see how the anime affects their next single. Ejc, oh come on, 46k is not bad sales also, it's what an average Nana Mizuki CD sells in a week, there may still those who are bitter at this moment, give it some time. If you read my further responses, it is not the 46000 that is disappointing, it is the almost 2000 sales drop from the first single when comparing their first week sales. Great for Aqours, the song and PV are extremely great, so I'm sure they'll get even bigger once the anime airs next season. ahh.. it's good to see LL on top again though not µ's this time. 2k lower than their 1st single... I say I am impressed. This is their 1st single without any help from the originals yet they managed to sell almost the same compared to their previous single. Disappointing first week sales for Aqours. The first single sold 48,477 in the first week, so I don't know what happened here. Here's hoping there was some sort of stock issue at storefront, and the second week is bigger for this single than the first single. The good news is that the first Aqours single is nearing 70,000, and would actually achieve something Idolmaster has never achieved... which is to have a CD sell above 70,000. I didn't know 46k is already considered disappointing sales (even for a juggernaut like Love Live) :o I'm actually impressed with these numbers considering that the era of μ's just ended and we know next to nothing about Aqours yet. Yes, 46000 sales is amazing for the majority of anime related artists (exclude MIZUKI Nana, and some of those mainstream artists), but we have to consider that they've had 6 live broadcasts so far on Nico Nico Live, LINE LIVE and Bandai Channel, been there as guests to personally open a new "gamers" store, had the SunShine anime announced, been added and featured in the mobile game, etc etc. These sales are considered disappointing because surely all this exposure would've at least brought in some new buying fans, but their first weeks sales have dropped from their first single. It could very well be due to stock issues at storefront or it could also be many fans sitting on the fence, as perhaps many have not read Dengeki G's magazine, or played the mobile game, or watched the live broadcasts to get to know the Aqours seiyuu and their characters, but the drop in sales is worrying. I guess that's understandable. Maybe a sizable contingent of buying fans haven't accepted Aqours yet... here's to hoping the anime might change their mind though. Can see now why they did another Idol event in the game recently. Always good to see the GazettE music selling well, loving their direction they're taking at the moment. Such a better sound. A shame DISORDER didn't sell that well, best OP of the season for me, helps that it's with a damn good show as well. 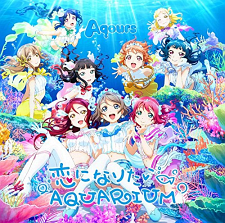 I quite like the new Aquors single; such a catchy song. I would consider buying the Asterix ED. AQUORS and King of Prism! My idol groups slaying! Other Love Live related sales for tihs week. Interesting Drama CDs... Kaori Oda's album and DISSIDIA FINAL FANTASY -Arcade- ORIGINAL SOUNDTRACK not doing so well.